There’s a sweet moment each evening at Treebones Resort when Big Sur unplugs from the rest of California. Somewhere below, the last car on Highway 1 cruises by as you watch the sun drop into the Pacific from your deckside Adirondack chair, 27 miles north of San Simeon. You’re isolated at Treebones, albeit in a lattice-framed yurt (one of 16) with pine flooring, outlets, and a sink. Five campsites are available for an earthier experience, but everyone gets complimentary do-it-yourself waffle breakfasts at the resort’s restaurant. Late afternoon, a sushi bar opens, too. » 877-424-4787 or treebonesresort.com. In a canyon below Ventana Inn & Spa, where rooms on summer weekends start at $1,100, Ventana Campground is Big Sur without the big price. 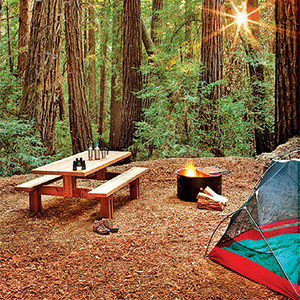 Arranged along a creek in a redwood stand, the 78 spacious sites, well groomed and equipped with fire rings and picnic tables, meld into a forest of muted sounds and filtered light. Campgrounds aren’t usually known for upscale dining, but a trail leads to the inn’s rustic yet modern Restaurant at Ventana, whose smoked brisket sandwich and black cod dinner are worth the climb. » ventanacamping.com. An allée of eucalyptus leads from Highway 1 on the San Mateo County coast to the rambling mesa of Costanoa Lodge. With beds, electricity, and locking doors, Costanoa’s tent bungalows are posh yet still tenty enough to rustle in the moist coastal breeze. 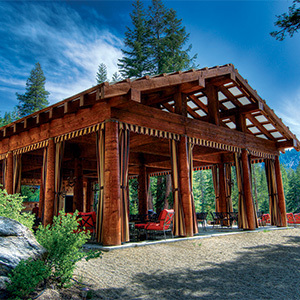 Comfort stations offer showers, toilets, and because you’re roughing it, outdoor fireplaces and dry saunas. The tents in Pine Village have fire pits, but Cypress Village provides more seclusion and shade. Or bivouac in a Douglas fir cabin with private bathrooms, Bose radios, and views of Whitehouse Canyon and a forested ridge from your porch swing. Just leave the MREs at home; Costanoa’s woodsy Cascade Bar & Grill will handle the wining and dining. » 877-262-7848 or costanoa.com. At times the wind coming off the ocean is as soft as a lamb; at others, as fierce as a lion. The drive to the remote north Santa Barbara County park is through oak-studded ranches that haven’t changed in 100 years, but the main draw is the beach scenery, which includes Point Conception lighthouse. The on-site store/café serves a delectable burger and stocks sundries, from board games to fleece sleeping bags. Hedges form buffers between the large toes-in-the-sand sites by Abalone Point, which afford the most privacy. » 805-736-6316 or sbparks.org/reservations. Among the most hallowed surf spots in the state, Trestles is also known by nonsurfers for its immaculate beach—and for having no public parking. The easiest access is from San Mateo Campground at San Onofre State Beach, which maintains a gentle mile-and-a-half trail to the storied surf breaks. The campsites are spacious, with native plants such as elderberry and sumac providing shade and some privacy. » 949-361-2531 or sanonofreparksfoundation.org. 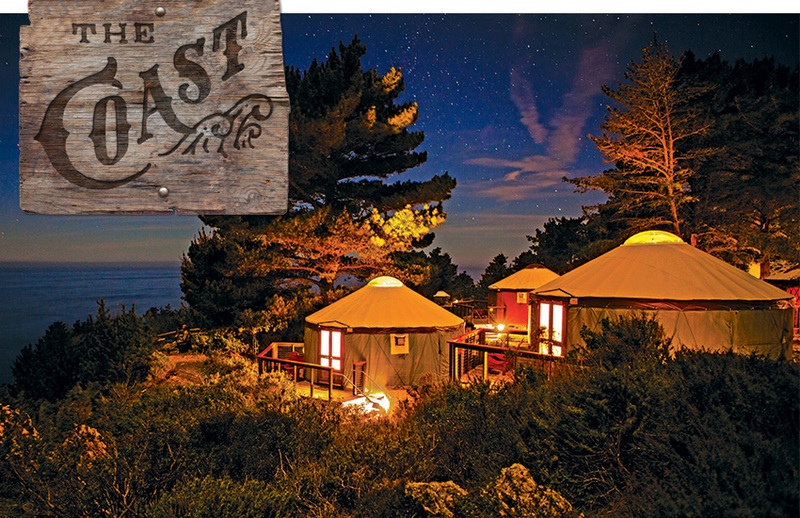 El Capitan Canyon eco-lodge is a rarity, one of the only Southern California spots where you can sleep in a coastal canyon beneath a creekside canopy of sycamore and coast live oak. Digs include cabins with Chumash decorative details, soaking tubs, and kitchenettes as well as wired yurts and safari tents. Each accommodation has its own metal-ringed fire pit for charring the tri-tip and marshmallows you bought at the general store. More exposed to Highway 101, the adjacent Ocean Mesa at El Capitan has tent sites and a heated pool while also offering access to facilities at its glam neighbor. » 866-352-2729 or elcapitancanyon.com. Ocean Mesa at El Capitan: 866-410-5783 or oceanmesa.com. A shiny compound of vintage Airstream trailers on De La Vina Street, Santa Barbara Autocamp is just two miles from downtown and three from the beach, splitting the difference between camping and staying in a cute motel. The 31-foot-long 1972 Sovereign, for one, is kitted out with a claw-foot tub, compact kitchen, and bedroom separated by a sliding door, with a queen bed that lists southeast toward Jimboz Lounge, the Bukowski-friendly cocktail bar next door. Two blocks away at Los Agaves, you can take your pick of ceviche tostadas and burritos stuffed with halibut and shrimp. » 888-405-7553 or autocamp.com. Booked solid six months in advance, the 58 sites on the bluff high above Laguna’s Crystal Cove State Park serve up an eyeful of the Pacific. This being coastal real estate, spaces are close to one another, and about half are reserved for RVs. But if you’re feeling claustrophobic, walk to the day-use area and spread out under a gazebo. Or try to snare one of the coveted cottages in the park’s historic district. » crystalcovestatepark.org. Matilija creek near Wheeler Gorge. Photograph courtesy Denise Philbert. It’s a short walk to the 12 sites here, but the distance between you and your car will only enhance the effect of being in the Eastern Sierra. Twenty-four miles from Lone Pine, up the steep Horseshoe Meadows Road, the campground puts you near the trail into the John Muir Wilderness, which leads to a string of bright blue alpine lakes filled with golden trout. » fs.usda.gov/inyo. Deer graze at the edges and wild turkeys stroll the grounds at Los Prietos, which stretches out in an oak woodland at the edge of the Santa Ynez Valley in the Los Padres National Forest. The smooth spaces look as if hobbits had come out and swept up the night before. During the driest periods, wood fires are banned. But there’s hiking, and the nearby wineries are so casual, you won’t feel out of place in your camp clothes. 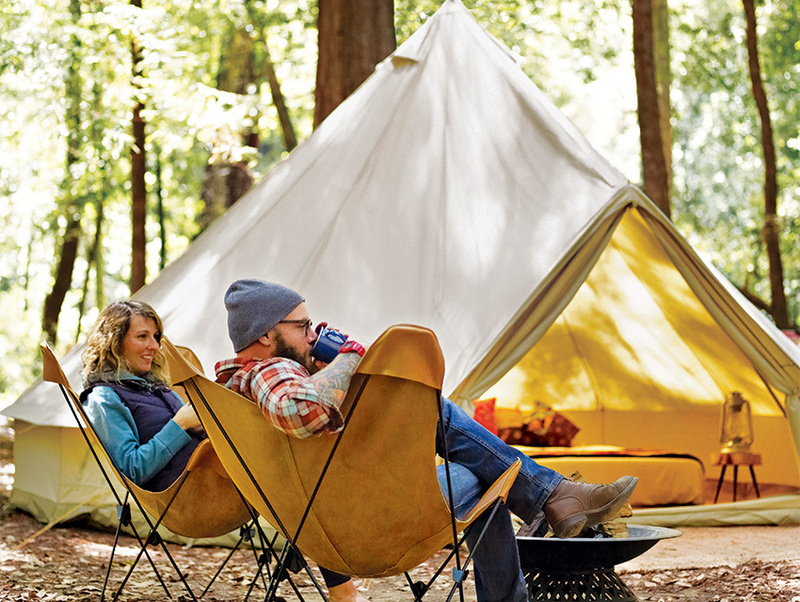 Halfway up the foothills of Sequoia National Park, above the middle fork of the Kaweah River, the 28 tent-only sites at Buckeye Flat are intimate and tranquil, offering abundant privacy among the buckeye trees, oaks, and occasional boulders. A path at the southern end leads to a footbridge and the rushing river, where you can fish for trout or hike beside it on the Paradise Creek Trail. A relatively short drive north brings you to the land of giant sequoias. If you’ve got a few days to explore Sequoia by car—the Giant Forest, Crystal Cave, Buck Rock Lookout—you won’t find a better base camp. Ride the Generals Highway from Fresno; after 60 miles branch left at the Big Meadow Winter Trailhead, then turn right at the dusty Starlight Trail. Where the redwoods thin a bit, you’ll find spacious sites between a forbidding granite slope and a happy little creek. The area has firewood to scavenge and rocks for pits, but bring a shovel unless you want to drive when nature calls. 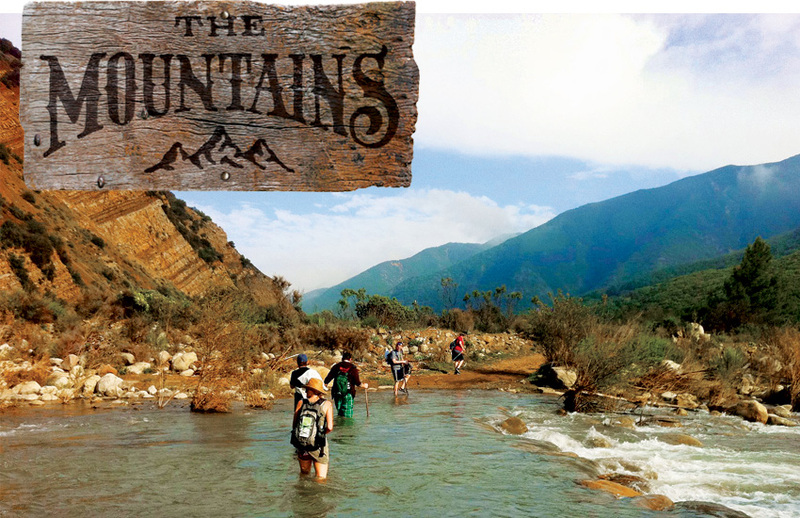 A stream runs through this spread of more than 80 sites, which you’ll find hiding a bit north of Ojai in Los Padres National Forest. As with other sites, insects thrive here during the warmer months, and the most enjoyable spots are farthest away from Highway 33. 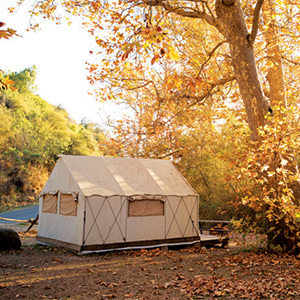 Wherever you pitch tent, oaks and pines provide a serene canopy, while a hike through Matilija Creek—the trailhead is a short drive away—offers a change of scenery. The eroded sandstone is so dramatic, you half expect to find the Mars rover trundling in the shadows. Halfway between L.A. and Lone Pine, Ricardo Campground puts you right up against the melty rock walls, where crackling fire rings cast a spectral glow at night. The 50 sites are first-come, first-served and give quick access to miles of high-desert hikes. Sitting outside your tent at Horse Flats, you’ll feel grateful for the towering Jeffrey pines and incredulous that you’re still in L.A. County. A half hour or so up Highway 2 in the San Gabriels, the campground’s 26 first-come, first-served sites are best during weekdays, when the crowds are as light as the mountain air. There are corrals and hitching posts for equestrians, along with hulking boulders for climbers, but a hike along Silver Moccasin Trail should be enough adventure for most. Sure, you could go all Cheryl Strayed and spend months on the Pacific Crest Trail, seeking transcendence. Or you could answer Sequoia High Sierra Camp’s call of the mild and sleep above Kings Canyon at 8,282 feet. A one-mile hike through a piney forest leads to 32 well-spaced tent cabins furnished with beds, chairs, even blinds. Three square meals are served each day, with fixings for picnic lunches to take along on hikes to alpine lakes or fly-fishing outings at nearby creeks. Then you can come back for a hot outdoor shower and a dinner of wild-caught king salmon in an open-sided dining pavilion before gathering round the communal campfire. » June 12-September 20. 866-654-2877 or sequoiahighsierracamp.com. Kate’s Lazy Desert. Photograph courtesy Kate’s Lazy Desert. Leave the Jumbo Rocks megacamp in your dust; a few more miles is all it takes to carve out your own space in the shadow of an incredible Joshua Tree boulder pile. Each of the 15 car-accessible sites comes with one of those looming natural art pieces (aim for site nine, opposite the trail to Arch Rock). Short hikes reveal otherworldly plants and arches. Arrive early to make sure you’re well positioned to catch the desert sunset. Sheephole Wilderness is the untamed cousin of Joshua Tree National Park. It might not have the twisted yuccas that define the stretch of the park along Highway 62, but the creosote-dotted Bureau of Land Management terrain is one reason why we love living out west. Located 20 miles east of Twentynine Palms, this section of the Mojave lies between two mountain ranges, the Sheep Holes and the Calumets. Camp at designated sites within the nearly 200,000-acre wilderness, and climb on giant rocks all day without seeing anyone other than the group you arrived with. The campground embodies the nothingness that you came to Death Valley to celebrate. Just a little more than 20 miles down Emigrant Canyon Road, it sits in Wild-rose Canyon (4,100-foot elevation) at the bottom of the Panamint Mountains. The endless views of multicolored rock and snow on the park’s highest peaks are a welcome reminder that you’re far away from the bars, restaurants, and general stores along the park’s only highway. 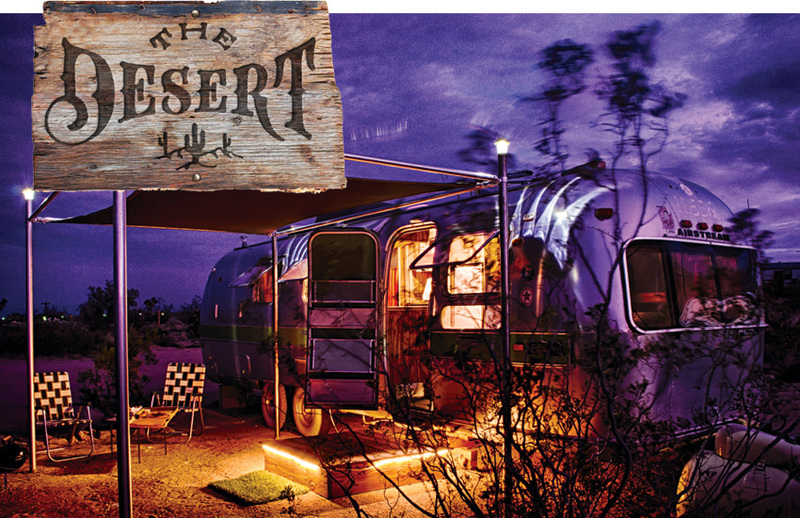 The bright colors and patterns of the six Airstream trailers at Kate’s Lazy Desert amplify the midcentury aesthetic of their owner, B-52’s singer Kate Pierson, but the high-desert landscape is the rock star. Found along a mile of car-shimmying dirt road in wide-open Landers, it’s a cushy, air-conditioned introduction to desert camping, with the twangy sounds and tangy barbecue of Pappy & Harriet’s 20 miles away. Hidden art and spiritualist compounds abound. If you want a “sound bath” at the Integratron, you’ll need to book three months ahead, but Noah Purifoy’s outdoor gallery is free and easy.